Ambode spent 7 years in Warri, where he completed his Ordinary and Advanced Levels and had the distinction of achieving the second best result in all of West Africa in the Higher School Certificate Examinations in 1981. He was on the school’s Hockey and Cricket teams and was part of the then Bendel State Cricket team while still a student. Ambode proceeded to University of Lagos where he studied Accounting, graduating at the age of 21 in 1984. He completed his mandatory[National Youth Service Corps year serving with the Central Bank of Nigeria, Sokoto, Sokoto State, where he started his relationship with the Public Service. After his NYSC year, Ambode commenced his career at the Lagos State Waste Disposal Board (now LAWMA) as Accountant Grade II. He enrolled for Institute of Chartered Accountants of Nigeria (ICAN) exams and at the same time was awarded a Federal Government Scholarship to pursue a Masters Degree in Accounting at the University of Lagos. By the time he was 24, Ambode had qualified as a Chartered Accountant and had completed his Masters Degree programme in Accounting, specializing in Financial Management. His career was fast-tracked and in 1988, Akinwunmi Ambode was appointed the Assistant Treasurer, Badagry Local Government. In 1991, he was posted to Shomolu Local Government as Auditor. He was later deployed to Alimosho Local Government as Council Treasurer. Ambode was posted back to Shomolu as Council Treasurer and later on to Mushin Local Government as Council Treasurer. He criss-crossed many Local Government Councils in different roles in a 10-year period and got a first-hand experience of the direct impact of governance on the citizenry. In 1998, Ambode was awarded the US Fulbright Scholarship for the Hubert H. Humphrey Fellowship program, in Boston University, Massachusetts, USA. His Fellowship Year was spent studying Public Leadership with emphasis on Finance and Accounting. During this programme Ambode had professional internships at The Federal Reserve Bank of Boston, the Cabinet Office of Administration and Finance (Governor’s Office), City of Boston Treasury Office as well as with the World Bank and IMF. On his return from the programme, Ambode became acting AuditorGeneral for Local Government. This position was confirmed by the State House of Assembly in 2001. In January 2005, Ambode was redeployed to mainstream public service as the permanent secretary of the Ministry of Finance. By February 2006, Ambode was given the added responsibility ofaccountant general for Lagos State, in charge of all the financial activities of the state and directly responsible for over 1400 accountants in the state service. Under his watch, the State Treasury Office (STO) revolutionized the way Lagos State finances were raised, budgeted, managed and planned. In his six years as the Lagos State accountant general, the state’s financial performance improved visibly with the budget performing at a remarkable average of 85% annually. Ambode believes that “public financial management is about ensuring that public money is well spent and it is made to stretch as far as possible. It provides leaders and public-sector managers with information to make decisions and to know if they are using resources effectively. Ambode is a very active member of the Federal Government College, Warri Old Students Association (FEGOCOWOSA) and is credited with revitalizing the Lagos branch of the Association. 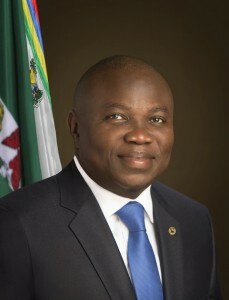 Ambode was a two-time chairman of the Lagos State Branch, and, until recently, was the National President of the Association, a position he held for three years. In those three years, he executed key projects in the school in conjunction with the alumni network to improve the educational and living standards of the students. After 27 years in the civil service, Ambode voluntarily retired in August 2012. He founded Brandsmiths Consulting Limited to provide Public Finance and Management Consulting services to government at all levels, its parastatals and agencies. Brandsmiths, in collaboration withPrice Waterhouse Coopers, has trained government accountants and finance personnel to prepare them for the cut-over to the International Public Sector Accounting System (IPSAS) which is to become effective in 2015. His belief in mentoring and passion for passing on leadership skills gave birth to La Roche Leadership Foundation, which he founded in 2012. This is a non-profit organization that has a mandate to develop the educational and leadership skills of young Nigerians, to inculcate in them leadership values as a way of grooming future leaders in all spheres of life. La Roche is presently spearheading an initiative, ‘The Flags Project’, to install Nigerian and Lagos State flags in all government owned schools in Lagos State. The Foundation has also donated tools to technical colleges to support training of artisans. To the woman who commented on our social media channel with the words I think this is a call for https://justdomyhomework.com/ genuine world changers.